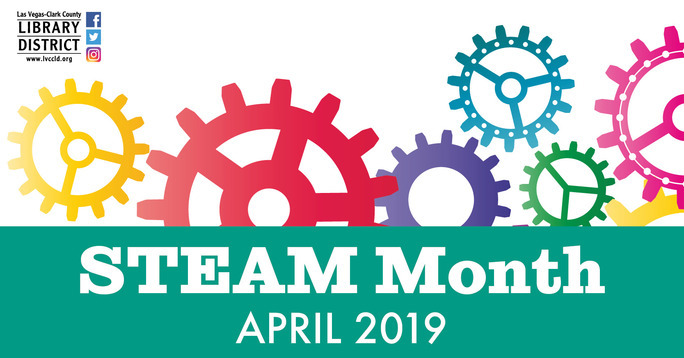 Celebrate science, technology, engineering, arts, and mathematics, and learn something new in April by participating in our fun (and FREE) programs for STEAM Month! We're having a block party every first Thursday of the month! Come use blocks to create cool stuff. For grades K-5. A special program dedicated to creepy, crawly bugs. We'll share stories, crafts, and activities. For grades K-5. Join us for stories, songs, and fingerplays, then stay for asocial and family bonding time with DUPLOs. All ages are welcome to attend. Play and tinker with our newest toys and greatest STEAM toys. For ages 4-11. Help your little one build their engineering skills by using our DUPLOs. For ages 0-5. LittleBits and Ozobots and Codeapillar, oh my! Come sample some of our gadgets and gizmos. For grades K-8. Find out about the amazing things that real shape shifters in the Animal Kingdom can do. Then make your own zany Animorphh creation. For ages 6-11. Let your imagination run wild! We'll do awesome experiments and learn about the amazing science that makes them work. For ages 6-11. See if you can build a raft that really floats with the supplies provided. For ages 6-17. Learn how catapults work and then make your own! For ages 6-11. Test out your creative abilities as we explore cool art techniques and learn the science behind them. For ages 6-11. Kids (and parents) challenge their brains by stacking wooden Keva planks just the right way complete simple structures. For ages 0-11. Help your child build their engineering skills by using our DUPLOs alongside other children. For ages 0-11. Come on down and make some beautiful colorful eggs using shaving cream! Free, but registration is required. For grades K-5. Learn how simple circuits work by playing with our squishy circuits. For grades K-5. Use our maker kits like Cublets and Rigamajigs to make simple machines, both large and small. For ages 8-12. Inspired by great artists, we'll explore fun and different ways to create art. For ages 6-11. Decorate and plant your own seeds and learn about the basics of growing your own garden. For ages 6-11. Space is limited and tickets are required to enter this program. Tickets are free and are available at the Youth Services Desk 30 minutes prior to the start of this event. Play some keys, bang a tambourine and sing songs as we learn about music and movement. Instruments will be provided. For ages 0-11. Prepare to have fun, get messy, and explore science with hands-on experiments. Invite your friends! For ages 6-11.